← Do Computers Hallucinate Electric Sheep? 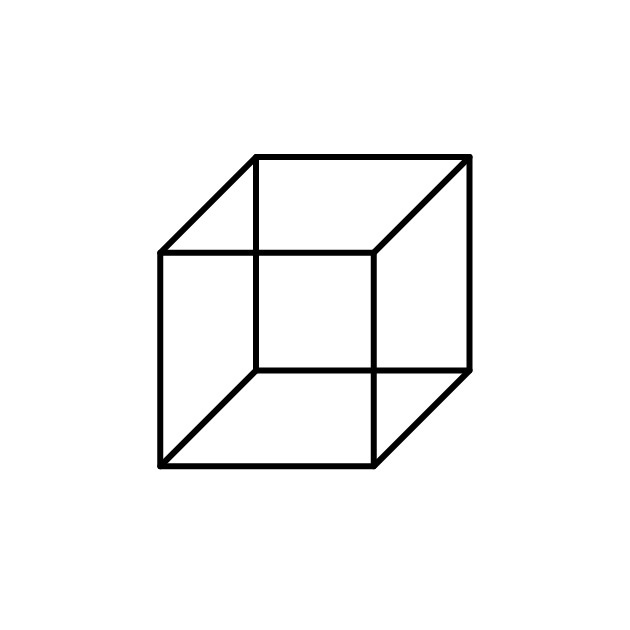 We all know the Necker Cube illusion – the ambiguous 2-dimensional line-drawing of a perfectly orthogonal cube that allows two opposing interpretations of 3-dimensionality. You can look at it from a top-down perspective which reveals the cube’s top and right face, or from a bottom-up perspective that shows the cube’s bottom and left face. Both interpretations are valid. The cube and its effects were first studied and published by Swiss crystallographer Louis Albert Necker in 1832. 1. – We can not not see it as three-dimensional. 2. – Our brain oscillates between the two interpretations. 1. – It is nearly impossible to look at the drawing without interpreting it as a three-dimensional object. Why? Because we live in a 3-dimensional world and possess a 2dimensional visual sensory system. In order to survive in this world, our brain learns to decode the 2-dimensional data from our eyes and maps it to an internal 3-dimensional model of our surrounding. The 2d-to-3d conversion makes use of such depth cues as perspective, shadows, texture gradients or overlapping of objects. The whole process happens at such an elementary intuitive level that we have a hard time counteracting it. Just try to look at the cube on the left as a 2-dimensional ornament (tilting your head counts as cheating) – it’s nearly impossible, isn’t it? 2. – Your brain oscillates between the two alternatives without giving you the option to stick with one of them. Now, the second fact about the Necker Cube is incredibly fascinating and a feature i seem to have overlooked all these countless times i’ve encountered the cube before. Not only can you intentionally flip between the two different 3-dimensional interpretations in your head, but your head also flips between them at a regular interval – if you want it or not! Look at the cube (for best results try to look at the white center of the cube) and focus on one of the two perspectives. After only a few seconds your chosen perspective seems to fade away and the other one takes hold of your visual attention. And a few seconds later it flips again! And again! Why? What you experience is a subjective spontaneous multistable perception – spontaneous oscillation between two possible interpretations. The research proposes that our visual processing system allows for the co-existence of both interpretations in our brain. The sets of neurons that are activated for each interpretation, compete against each other. The oscillation occurs as one set of neurons gets tired and allows the competing set to take over. Another theory claims that our eyes constant involuntary movements – the saccades – are the reason for the oscillatory behavior. As the eyes move their center of attention in small fast steps across the cube, their positions trigger one or the other interpretation to take over. I have the impression the cube flips over mostly in that instant when the back and the front vertical edge overlap. Multistable perception of objects requires completely ambiguous stimuli that lack any cues of depth and orientation. Yet, interestingly enough, you can also force its occurrence with clearly non-ambiguous 3-dimensional objects. 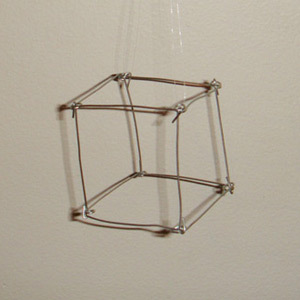 I build this very sketchy wire-cube you see on the right, and managed to experience similar oscillations of perspective. Of course, the results were less evident as with the 2-dimensional input. But by staring at the center of the cube and shifting the layer of focus onto a point further in the background, the cube lost some of its apparent depth cues and become blurrier and flatter, which allowed the switch of interpretative perspective. It is easy to have them rotate in the same direction, so try flipping one of them around, so they rotate against each other. Also, another observation: If you focus on having them rotate in different directions, one blink usually destroys that. You blink and when you gain back your vision the cubes rotate in the same direction. Because having them share the same perspective is the easier choice. Posted in Research and tagged 2011, Necker cube, optical illusion, perception, processingjs. One Response to An Oscillating Reality Battle!